I recently was asked to draw and design some bookplates and postcards for Literati, which is a book club for kids. They send out curated collections of children’s books, and each of these has a theme. The theme I was asked to illustrate was “Heroes,” and I’m a Veterinarian from the Tinyville Town series is part of the collection of books. Along with the artwork, I got to talk about my work and answer some questions via a short interview. Here’s a link to the interview, but I’m gonna copy/paste the whole thing below, for posterity. In the past, I felt I didn’t have much to say about why I make the books I make and what’s important to me in going about it. Lately though, maybe as my own kids are getting older (17 and 18) and maybe as we’re living in this age of Trump and the daily embarrassment and, well, horror, frankly, that goes along with that, I’m finding I’ve got words. Stay tuned for more. In discussions on your early comics, Frederick & Eloise and Dear Julia, you’ve listed artists such as Edward Gorey, Jacques Tardi, and Jim Jarmusch as influences. What intrigued you about their work when you were working on your comics, and has their influence crept into your books for children at all? I grew up in a time and place of The Love Boat, Chips, and Gilligan’s Island reruns. I knew I had a dark, or “weird” streak but in the suburbs of Houston in the 80s, I didn’t have a name for it or a place to put it. I first ran across Gorey’s The Gashlycrumb Tinies my first year of college, and that dark humor was a revelation. It was later, living in Paris, where Tardi and Jarmusch appeared in my world, and they were more about a mood and a different way of storytelling that I hadn’t seen to that point. Over the last fifteen years of making kids’ books, I’ve kind of kept those influences in my pocket, I think. I haven’t had the opportunity to pull that stuff out for the books I’ve worked on yet. There are plenty of strains of that kind of thing in middle-grade, like Lemony Snicket of course. And some picture book artists seem to be able to get away with it too, especially the Europeans like Wolf Erlbruch (see Duck, Death and the Tulip to see what I mean). Sendak and Lobel among others were able to bring darker themes into their work as well, but today’s market seems to limit it somewhat. These darker, “weird” stories are what naturally exists in my head, so hope to bring that world into my kids’ books at some point. It’s cute, but it bites. Are you still creating, or do you have plans to create, more comics or graphic novels for an older audience? While I’ve been saying “yes” to this question since 1996, with no real results to speak of, I started writing something a comic last Spring that has potential. It’s about a guy who is dying. Probably not for kids. Was it a challenge to move from writing comics for adults to picture books for young people? Stories “for kids” aren’t what naturally comes out of my pen. I find that because of this, I over-compensate when I write, and end up oversimplifying and maybe not giving the potential younger audience enough credit. Thank god for editors. The two book series I’ve written, Everything Goes and Tinyville Town, do a lot of things I want to do. But finding the voice of those books was more work than it maybe should have been. Many of your books for children (in particular Everything Goes On Land and, of course, the Tinyville Town series) are based on cities, with a focus on the way citizens work together and keep their community running. You’ve been recognized for your attention to diversity in these fictional cities. Can you tell us a bit about why representation was important to you when creating these characters? Because it’s what exists in real life. I can’t even think of a reason why a city or community wouldn’t be represented this way. Your newest release, (This Is Not A Normal) Animal Book with author Julie Segal-Walters, just came out in October. What was the process/collaboration like between you and Julie on this hilarious book? Well, nothing like the book would imply, of course. She wrote the manuscript in 2014, and I didn’t see it until six months later. She saw sketches now and then as I worked on the art, but there was no collaboration per se. This is the way picture books almost always work, by the way. The writer and artist rarely have any communication during the process. The book pretends otherwise, which is most of the joke. You’re right, it is hilarious and I had a great time making it. Which artists or illustrators have had the most influence on your style and approach to your work for children? This is always so hard to answer. There are so many ways to approach the question. I see work all the time that inspires me and makes me want to draw like that, or tell stories like that. I can’t leave a bookstore without seeing at least one book that depresses me because it’s so good and I wish I’d done it. A thousand illustrators have influenced a thousand of my drawings, and while there are probably a few giants that I tried to emulate as I developed my work, the last time I can actually remember actually sitting down and changing the way I draw a picture was when I rediscovered the singular Mexican printmaker José Posada a few years back. Would you see that influence in my current drawings? Well, I do, but I would doubt anyone else would. The real answer here is probably Maurice Sendak. 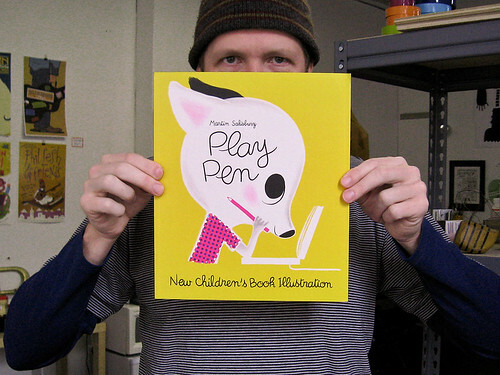 Not in any particular method or technique he used to draw pictures, but in his commitment to honesty in his way of writing about children, for children. Where the Wild Things Are came out in 1963, and Max’s emotions and imaginings in that book may have scared a bunch of parents and librarians back then, but kids knew it was the truth. This is totally aspirational for me. If I even get close to that in my own storytelling in my lifetime, I think I’ll be satisfied. What is your favorite interaction you’ve had with a child about your work? What tips do you have for the young person who wants to create books? A big part of the job that editors and agents do, is look for and find new work by new talent with new things to say. No matter how hard it seems to get through that door, keep writing, keep drawing, and keep knocking. They’re looking for you, too. What’s next for you, in Tinyville Town and beyond? I’m a Mail Carrier will be out in March, which is the next Tinyville Town book. And I’ll be illustrating four picture books in 2018, including one which is a Tinyville Town book, and one of which is a book I wrote about an astronaut who just wants to take a walk. Julie over at Kirkus asked me a few questions last week, and I gave her answers. These were written before the election on Tuesday, and my feelings about the series and about our responsibilities and as parents and adults are even stronger now, two days after watching this unmitigated disaster take place. The world I want my kids (all kids) to grow up in is a different one than this new president represents. Maybe you feel differently about the events than I do. And that’s fine. If so, don’t gripe at me here about it. Go make a children’s book. Is Cartoon-tastic a word? It is now. The internet says so. BookPage reviewed Frank Einstein and the Antimatter Motor today, and they published a “Behind the Book” feature where Jon and I discuss our favorite scenes from the book. We look handsome in our photos. Here’s the link to the review. 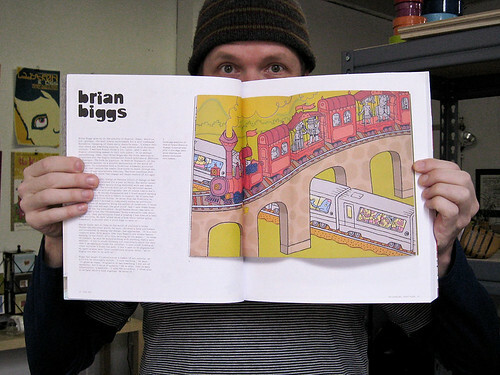 And here’s the “Behind the Book” feature. I get invited to local book fairs, book stores, book festivals, and so on; and I often run into this dude named Erik. Erik is probably something like 13 years old, and Erik loves books. He writes a column for his local newspaper, The Upper Bucks County Free Press about books, and he has his own blog, called This Kid Reviews Books. Recently at one of these local book events where I run into Erik, he asked if he could interview me for his blog, and of course I said yes. Erik’s interview was published this week, and here it is. 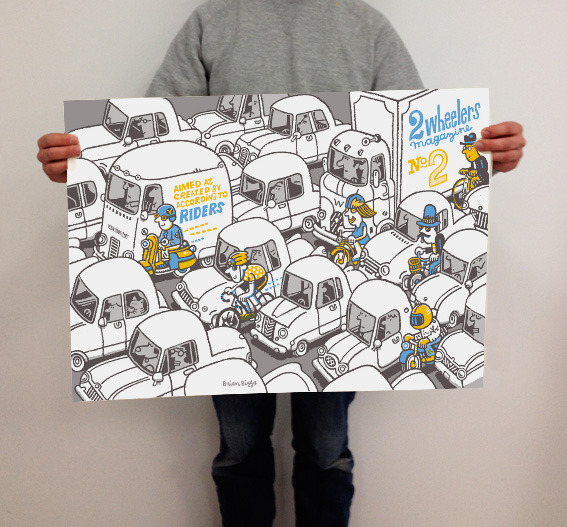 2wheelers is a magazine/journal from Sweden, and they asked me to design the cover of their second issue. You might notice a familiar theme in this design. In the video, pay special attention at about :42. Also, you need the poster. Big screenprinted thing. They really did an amazing job. Click on the image to go to their online shop. There’s a really swell piece in Publisher’s Weekly about Everything Goes. Since I don’t have a nice graphic to use for the piece, I’ll post this great cutaway of an RV that is part of the collection of reference material I found on the Google Images as the interview mentions. Here’s the link to the PW article. I was interviewed by Tony Lewis of The Artfuls a few weeks ago. It’s a really nice site with some terrific design. In addition, it’s always fun to read interviews with other illustrators and learn what they listen to, what materials they use, and so on. So the interview went live today. Enjoy. A few weeks ago I answered some questions put forth by Kelly Erb of tinytreasury dot com. It was for a series she thunk up called “Friday Fifteen” in which up-and-coming kid’s book types pretend to be famous for a minute or two. Mine went up on March 2. Enjoy.